Like the whole body, very powerful and imposing. The massive skull is wide, slightly arched and the sides slope in a gentle curve into the very strongly developed, high cheek bones. Occiput only moderately developed. The supra-orbital ridge is very strongly developed and forms nearly a right angle with the long axis of the head. Deeply imbedded between the eyes and starting at the root of the muzzle, a furrow runs over the whole skull. It is strongly marked in the first half, gradually disappearing toward the base of the occiput. The lines at the sides of the head diverge considerably from the outer corner of the eyes toward the back of the head. The skin of the forehead, above the eyes, forms rather noticeable wrinkles, more or less pronounced, which converge toward the furrow. Especially when the dog is alert or at attention the wrinkles are more visible without in the least giving the impression of morosity. Too strongly developed wrinkles are not desired. The slope from the skull to the muzzle is sudden and rather steep. The muzzle is short, does not taper, and the vertical depth at the root of the muzzle must be greater than the length of the muzzle. The bridge of the muzzle is not arched, but straight; in some dogs, occasionally, slightly broken. A rather wide, well-marked, shallow furrow runs from the root of the muzzle over the entire bridge of the muzzle to the nose. The flews of the upper jaw are strongly developed, not sharply cut, but turning in a beautiful curve into the lower edge, and slightly overhanging. The flews of the lower jaw must not be deeply pendant. The teeth should be sound and strong and should meet in either a scissors or an even bite; the scissors bite being preferable. The undershot bite, although sometimes found with good specimens, is not desirable. The overshot bite is a fault. A black roof to the mouth is desirable. Nose (Schwamm) - Very substantial, broad, with wide open nostrils, and, like the lips, always black. Very dense, short-haired (stockhSaint Bernardrig), lying smooth, tough, without however feeling rough to the touch. The thighs are slightly bushy. The tail at the root has longer and denser hair which gradually becomes shorter toward the tip. The tail appears bushy, not forming a flag. White with red or red with white, the red in its various shades; brindle patches with white markings. The colors red and brown-yellow are of entirely equal value. Necessary markings are: white chest, feet and tip of tail, noseband, collar or spot on the nape; the latter and blaze are very desirable. Never of one color or without white. Faulty are all other colors, except the favorite dark shadings on the head (mask) and ears. One distinguishes between mantle dogs and splashcoated dogs. The longhaired type completely resembles the shorthaired type except for the coat which is not shorthaired (stockhSaint Bernardrig) but of medium length plain to slightly wavy, never rolled or curly and not shaggy either. Usually, on the back, especially from the region of the haunches to the rump, the hair is more wavy, a condition, by the way, that is slightly indicated in the shorthaired dogs. The tail is bushy with dense hair of moderate length. Rolled or curly hair, or a flag tail, is faulty. Face and ears are covered with short and soft hair; longer hair at the base of the ear is permissible. Forelegs only slightly feathered; thighs very bushy. Click Here to Learn about breeder background checks on Saint Bernard breeders if you are looking for Saint Bernard puppies for sale. Click Here to learn how ResearchBreeder.com can help you find healthy Saint Bernard puppies for sale.Saint Bernard puppies for sale. Click Here to order a Breeder or Kennel Background Check on Saint Bernard Breeders that may have Saint Bernard puppies for sale. Click here to find the national breed club for Saint Bernard puppies for sale. 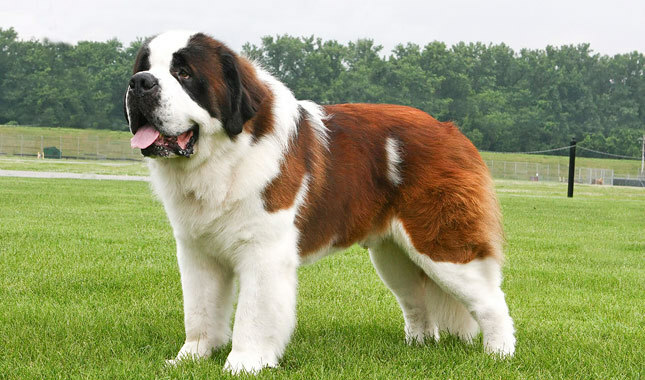 Click Here to purchase a list of approved ResearchBreeder.com Saint Bernard Breeders who have Saint Bernard puppies for sale.